Will it be a single or a double scoop? This children's sewing pattern for a loose-fitting, pull-on smock dress or blouse features a one-piece V-notch yoke and button loop closure. This sewing pattern for girls includes three views: a dress with double-thickness hem and matching pockets, a color-blocked dress in the same style, and a blouse-length version of the dress. Share your photos on Instagram with the hashtags #icecreamdresspattern and #oliverands. Girl's dress. Loose-fitting pull-on smock dress or blouse has one-piece V-notch yoke and button loop closure. View A includes a double-thickness hem and matching pockets, View B is a color-blocked dress of the same style, and View C is a blouse-length version of the dress. After successfully sewing this pattern, you will have developed the following skills: French seams, gathering, and patch pockets. Light- to medium-weight woven fabrics like quilting cotton, broadcloth, lawn, shirting, poplin, fine-wale corduroy, silk taffeta or dupioni, and linen. Thread, one 3/8" or 1/2" button, two 1" x 5" strips of lightweight fusible interfacing. Dress length* (Views A and B) 18" 19" 20" 21" 22" 23 1/4"
Armhole 8" 8 1/4" 8 1/2" 8 3/4" 9" 9 1/2"
Sleeve edge to sleeve edge 12 1/2" 13" 13 1/2" 13 3/4" 14 1/4" 14 3/4"
Blouse length* (View C) 13 1/2" 13 3/4" 14 1/4" 14 1/2" 15" 15 1/2"
Dress length* (Views A and B) 24 3/4" 26 1/4" 27 3/4" 29 1/4" 30 3/4" 32 1/4"
Armhole 10" 10 1/2" 11" 11 1/2" 12" 12 1/2"
Sleeve edge to sleeve edge 15 1/4" 15 3/4" 16 1/2" 17" 17 3/4" 18 1/4"
Blouse length* (View C) 16 1/4" 17" 17 3/4" 18 1/2" 19 1/4" 20"
I used the dress pattern as a top for some shorts for my grand daughter. I used jersey knit fabric which made the top stitching around the neckline absolutely necessary so that it held its shape. After several launderings, it still looks great. And the outfit is adorable - not because I made it, but because the design of the pattern is perfect for that “ just learning to walk” ball of energy!! I love this dress. I've probably made this half a dozen times and had to upsize to the "big girl" size. She wanted this for her back to school dress. This pattern is what gave me the confidence to sew for the kids. It is so well written and illustrated. I am just completing the Ice Cream tunic for my granddaughter, about to turn 2. I am making the 4 year old size on the basis that she is growing fast and it may be a reasonable fit next Californian summer (I am in New Zealand). I am using a cotton lawn, and for my next version am likely to use a chambray with some body for a different look and feel. I really like the pattern- it goes together quickly and easily, and the design is fresh and versatile. For those sewists who dislike making buttonholes or avoid zips, the fabric button loop is perfect. The pattern has the yoke finished by using edge stitch on the outside to complete the union of yoke and skirt. However, the garment could be also made so that the yoke facing has the final stitching (eg hand stitched down then top stitched). This would not give the very crisp look in the design, but may be easier in some cases to achieve a neat look. The dress came together quickly. Recommend it for a fast, fun pattern--I did the color blocking dress. For my toddler, I think next time I'll do it as a tunic/blouse. A beautiful little dress with nice details, fun to play around with different fabrics and colours Great instructions and a great fit. The little recipient was very satisfied! This was my first time sewing clothing, as a quilter I have experience with sewing but garment sewing is pretty different. I am thankful that I chose this Oliver+S pattern to start with! The directions along with the illustrations and helpful tips made everything extremely simple to understand. I started by making the blouse, my daughter loves it! I did add a bottom panel (using View A's bottom panel for the right shape and width, but cut down to the size I wanted, about 3.5 inches, and then added the panel using the View B instructions.) to the top for more contrast and mostly to give my long waisted girl more time in the top. I loved making the blouse so much, I also made the View A dress. That was really fun to make! The gathering on both views was a cinch to do and the pockets were so nice to make! As this was my first pattern, I enjoyed the flexibility of the digital pattern printing, especially when adding the panel to the blouse. I didn't have to worry about ruining the tissue and I like how sturdy each part felt as I was cutting around them! I made the tunic in a crazy tula pink quilting cotton and it's adorable. This pattern is very similar the geranium dress, however it has the advantage that the waist is higher. This means that there are fewer buttons and it'seems easier to get on and off. Great top. This was my second Oliver & S dress. I am getting back into sewing and found parts of the dress a little tricky but the directions were excellent and I had no trouble. I bought a size 4 for my almost 4 year old granddaughter. Since her measurements don't follow the sizing measurements, I went by the chest size and it fit perfectly. She is a 5 in RTW. Can't wait to make my next Oliver & S outfit. This was my first sewing project. It was easy to follow and the dress turned out well. So far I've only made the shirt from this pattern but I have made it twice and I am totally obsessed. The instructions were very straightforward and easy to understand, and the shirt is absolutely adorable. This was a very fun and satisfying sew. It came together very quickly as the instructions were very easy to follow with the extensive details and handy tips. As a fairly new sewer I find these patterns easier to understand than ones from the big pattern companies. Working through a pattern of Liesl's boosts your confidence, and I was thrilled how the dress turned out. Thankfully, my 3 yo was just as thrilled with her new dress as she wanted to wear it straight away! I would recommend this pattern and plan on making more versions. I thoroughly enjoyed making this dress and didn't have to use my seam ripper either which was a bonus!! I've already made two dresses and two blouses for my 18 month old daughter. The pattern was easy to follow and it was a quick sew. Something I could work on during naps. The hardest part was feeding the turned edges in while top stitching for to yoke and bottom piece. Otherwise super easy, really cute. This was a great pattern to get started with. I am not a great sewer, mostly curtains, so I undertook this one with the help of my mom. We had great luck following the sew-along from Rebekah at Wisconstitches.wordpress.com. The extra pictures helped explain the steps. As a beginner I chose to skip the v detail at the pocket but did the neckline one. Mom did the gathers at the breastbone. I did find that in cutting the size 6 pattern I was able to use less fabric by changing up the cutting layout and folding the fabric. Just barely. Any larger size and it would not have worked for the 44" fabric width I was using. I did also find that because I was sizing up it was really too long and decided to hem up the bottom a bit. I would make this pattern again. I do also wish the the digital print came with an option to print on 11x17 sheets. This would save some cutting and taping. 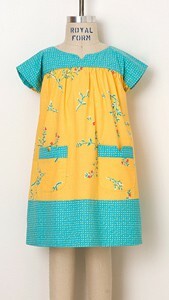 I made this cute dress for my granddaughter who is 4 years old, so the size 4. I measured her against the pattern, and no alterations were necessary. Being a well seasoned sewer, I could probably have made the dress without the instructions, but the first time I make a pattern, I follow them to the letter. I used a beautiful Liberty of London print for the body, and a solid knit for the band, yoke and pocket tops. The only thing I did differently, was in sewing the dress to the yoke, the pattern said to stitch the facing to the wrong side, then topstitch the outer afterwards. I prefer to stitch the outer right sides together with the dress, then stitch in the ditch to secure the facing. This is just a preference and not a knockdown on the rating. This was my first Oliver + S pattern and I'm very pleased with the way it turned out. I made it in size 2T for my 2 year-old granddaughter and modified it only by shortening the hem band 1 inch based on her measurements. It fit perfectly, even fitting over her rather large head. Four stars because attaching the back yoke to the back dress as per directions left an unsatisfactory finish, with a few threads poking through, despite my best efforts. I countered by covering them with a bar tack, a tip I found somewhere in the discussion of this pattern either here or on Flickr. (So grateful for all the input from others!) Looking forward to making it again. Tracing and cutting this out is certainly tedious. It also seems to take a lot of fabric. I'm just starting on the blouse. When I look at pictures on flickr some of the view A dresses look odd- like the bottom panel is too long to look right. Other pictures look ok. I will make view A next and see how I like it. 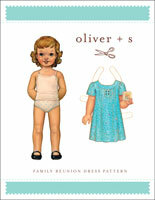 I love all of the Oliver + S patterns and I hope to learn to love this too. This is my second Oliver+s pattern and I'm loving them. I have now made this pattern up twice for my 3yr old granddaughter, once as a top and then as a dress with the contrast trim and pockets. It is a sweet style and easy to wear; the size 4 top is roomy enough to go over a long sleeve t-shirt and leggings and looks very cute on her. The armholes seem loose enough now, but after reading comments about the armhole size, I would take that into account when making up another garment. It is an easy pattern to follow and make up and I like the way the yoke attaches with no raw seam allowances showing. I thought this pattern was trickier to follow than expected for two out of five stars. I guess I have followed mostly tutorials before, but I did not find the sewing difficult, or really the pattern, just the wording on how to piece the items together. The dress turned out nicely, but, as others have written, the arm holes are tight on my (very thin) 5 y.o. Pattern is realy nice and easy to sew. In few days I already sew two dresses. Digital pattern is perfect. I have made the pattern in the smaller size range before and always loved it. I finally needed the 5yr plus pattern and ordered the digital. While I am always happy with the finished product I would not order this size in digital again as it used much more paper and ink than I expected. For myself I think I would go with the paper pattern in the future. I made a 3T for my granddaughter who is tall and slim, and not quite 3. It was fairly easy to make but, although very roomy in the dress section, it seemed too snug in the yoke section. In particular the armholes seem too high, or too small. I am not that experienced at alterations and not quite sure how to address this issue. I thought I might make the yoke a little deeper next time. I also wondered whether the yoke section was too wide for her shoulders. She loved the dress and it did look lovely on so I will make another. I learned quite a bit from making this pattern as the directions were good. I absolutely love this pattern. It looks super cute on and most importantly my daughter loves to wear it. I have made three versions now and all look super professional. It is very easy to sew and the French seams work really well. The neck opening is a little large if you sew it with the recommended 1/2 inch seam, but now I sew it with a 3/8 inch seam and it sits and looks better. I will definately make this pattern again and again. The dress is adorable and just the sort of 'over dress' my granddaughter loves to wear. This was my first download experience, which went smoothly, but does add a few steps to the whole project! I seriously doubt I will use digital again. The instructions were clear, I used the French seams as suggested on the side seams and was not completely happy with the under-arm curve...difficult to 'straighten' as described. Also the neckline just about fell off one shoulder or the other, so I was very surprised to read another seamstress had the opposite problem, with the neckline being to small! I made this dress in a size 5 for my tall 4 yr old, I couldn't get it over her head. She has a normal sized head so I'm surprised I'm the only one with this issue. Suzy, we're sorry for the difficulty you had. We haven't heard of this issue before with the pattern, and if it were a pattern-related issue we would have heard from others by this point. I really enjoyed sewing this pattern up, I've made it twice and will be making it again. I learned a few new things as well. The instructions are very well written, I had to just follow them as I hadn't sewn a dress this way before (most of the seams are hidden in the linings) and it all worked out even better than I thought it would. Once I printed the pattern in the proper format everything else was a breeze. I had purchased a linen table cloth for .50 cents at a yard sale with a detail edge. I used the detail edge and did not have to hem the tunic. It turned out adorable! I ordered this pattern to make dresses for my daughter and neice for my sisters wedding. I didn't actually do any sewing (cue my mother and sister in law). We found the pattern to be very expensive for what it is (it cost me $24 AUD) and then I had to pay another $13 and go through a lot of hassle to get the pattern specially printed for it to be usuable. This seems really pricey for a downloadable pattern and was not very accesible. I think the pattern itself was pretty simple to follow once we actually got it printed. The dresses were done in browny/creamy linen colours with purple pockets. It turned out to be pretty cute. But the cost once we bought the fabric meant that we ended up having $60 dresses for an 18 month old when we were hoping that hand making them would save money. Not sure I'll ever purchase from here again for that reason. 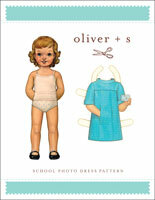 This was the first Oliver + S pattern I ever sewed, and it got me absolutely hooked. It's not hard to make but looks so professional when done. The neckline and pocket details make all the difference. I absolutely love the end result, it turned out to be a beautiful dress! I am already trying out another view of this pattern. I wish it came in adult sizes! I would love to sew an icecream top for myself! love the pattern specially the tunic version.my daughter is just 6 months so tunics look v beautiful on her.i made a lot of tunics with remnants that go with jeans/leggings and make a perfect outfit.a very quick project. I bought this hoping for a simple spring/summer blouse pattern, and fell in love! The directions are clear, and the blouse looks professional and beautiful with little fuss. Usually I make 1-2 items from a pattern before trying to find something better, but I'm making 7 of these to start! 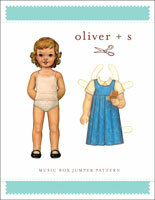 Oliver +s is my first commercial pattern. I do not sew much, but when my daughter tried the dress on I was surprised, it was so simple yet elegant. I am not very good at English, but the pattern's instruction is very very clear to follow. I have learnt a lot from it. a little problem, my daughter's long hair sometimes caught up by the button. it would be nice if there is an alternative closure included in the pattern. anyway, I really like the pattern! This dress was perfect! I lengthened the sleeve and added a ruffle. It is just perfect. 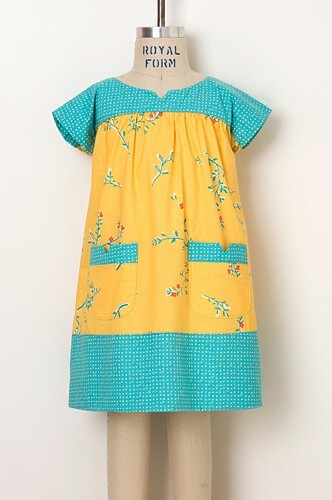 You can see a picture at www.LILAandG.com it is the woodland dress. Sweet, simple, and totally moreish - just like ice-cream! I made one of these for my youngest daughter, and her older sister loved it so much that I bought the larger size of the pattern for her as well. Just lovely. As usual,ove the style, love the drafting. Love the finished product. I did eliminate the v in the pockets and neck, as I was in a hurray and didn't want to rush these details. Oliver and s deliver again! I am not an awesome seamstress, but this pattern is so well written that it makes me look like I know what I'm doing. I love the versitility. This is an adorable, classic style, and the pattern is so clean and well-written! 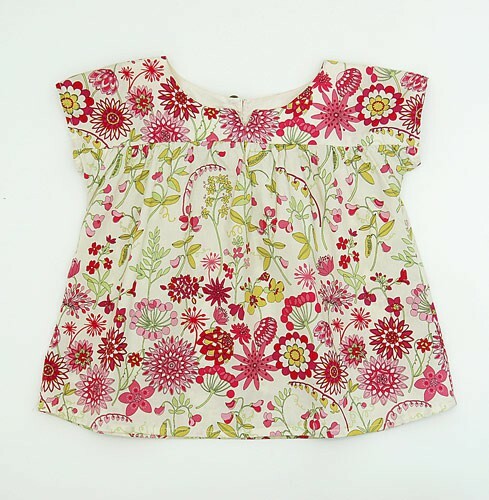 I have made the tunic top for my daughter, and can see myself making it again and again as she grows. Please note that the following errata notices apply only to the printed version of this pattern. These issues have been fixed in the digital version of the pattern available now. Please note that the first printing of this pattern contained an error in the cutting instructions for the small size package only (sizes 6M-4). The cutting instructions for piece #4, the Dress Bottom Panel, View A should read cut 4 instead of cut 2 on fold. This error has been corrected in subsequent printings. Please note that the yardage requirements printed on the pattern envelope in the first printing contained a minor error. As printed, the fabric requirements for View A, Fabric A will give you sufficient yardage to make the dress with a single-thickness hem. This error has been corrected in subsequent printings. Note that in the first printing of this pattern, the cutting layout for View B, piece 8 contained an error. It should read "View B, Fabric C" as shown below. This issue has been corrected in subsequent printings. 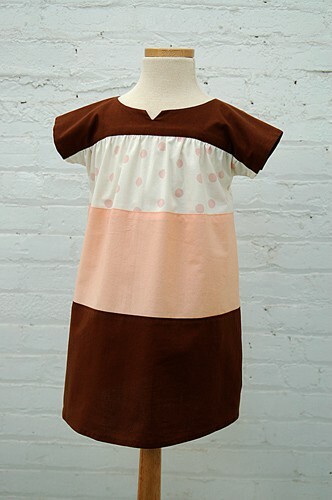 Discussion on the digital ice cream dress sewing pattern from the Oliver + S Discussion Forums. Find and share more photos on Instagram using the hashtags #icecreamdresspattern and #oliverands.